This past weekend I attended the Dark Star GT in Minneapolis, had a fantastic time, and want to tell you all about it! I’d been working towards being able to bring 1850 points of Eldar to the table for this event for the last several months. Part of my experience with this event was that accomplishment. So much time was put into modeling, sculpting, and painting that I had not had much time to practice with the build… or the army. 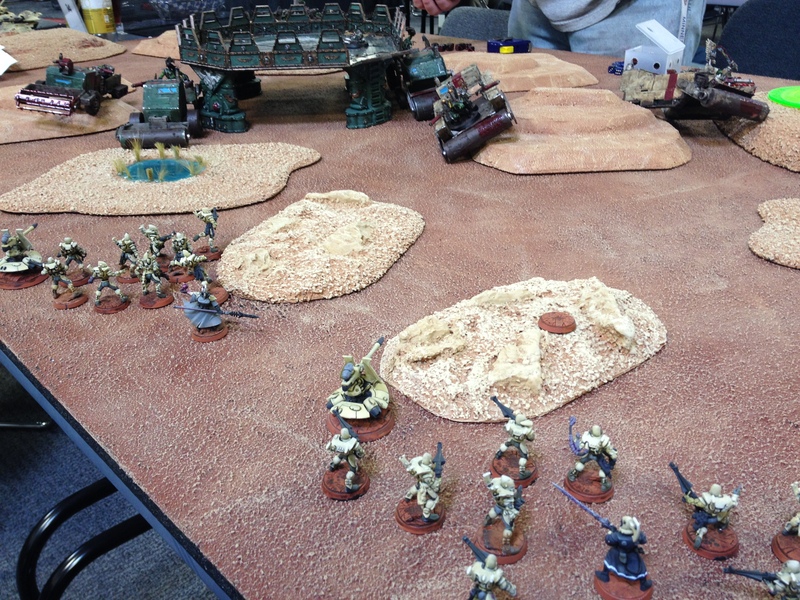 To be frank, game one was the first game I had played with the Eldar since 2nd edition! Another huge plus to the event is that it was hosted at the Fantasy Flight Games Game Center. This place is great, essentially a decent sized game store that has a great play space, awesome staff, food, and most importantly beer! The surroundings gave the event a great feel. It was a strength upon the event’s natural strengths… more on that in a sec. I was a bit apprehensive about going to this event. I have a great opinion of the people organizing the event, and I had faith that they would put on a good show, but I wasn’t sure what the player base would be like. Turns out I had some fantastic opponents, all of whom I would gladly play again. My first opponent was Tim Flanders with his excellent ‘Knights Vigilant’ Space Marines base off of the Iron Hands chapter tactics. It took me a sec to get my head into the game, but Tim was very relaxed and happy to have a relatively chill game, which eventually escalated into an exciting and close matchup. 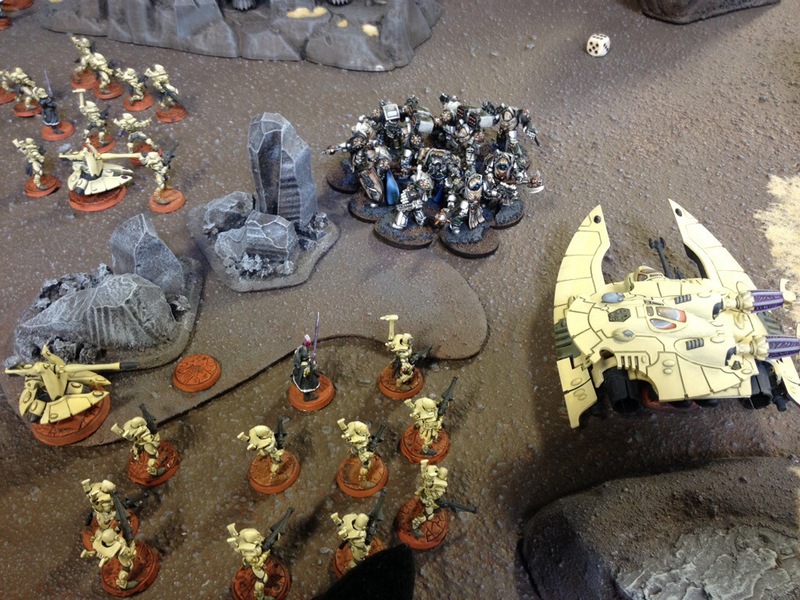 Much of the game was made up of isolated skirmishes on the flanks until the last several turns when a Terminator teleport assault forced my Guardian squads protecting objectives into the fight. another giant mass of terminators teleports right in front of my line! These guys were great examples of a common theme with Tim’s dice rolling for our game: Roll several 1’s for saving throws when hit by a fusillade of Shuriken fire, only to nail the 6’s needed to make the Iron Warrior Feel No Pain save! Tim managed to do this a pile of times throughout the game. The real problem was that these terminators were lead by Magus-Incantor Herod, the Knight’s librarian. Eventually he was able to charge my Farseer’s unit and call him out in a challenge. I am not sure why I didn’t have him slink back to the edge of the unit (the farseer and I both knew what was going to happen), I think I was hoping he would tank enough wounds to keep the guardians on the nearby objective. I guess this worked, but we each achieved the Slay The Warlord objective in this game. My MVPs of this game, the Wraithguard managed to grab an objective in the enemy deployment zone which put me one point ahead at the end of the game! Ryan Carlson did an amazing job with his Necron force! So much so that he won best painted for the event! Well don Ryan!! We received a nice complement that our game was the best looking matchup of the weekend! It was very cool to see our armies facing each other. It was one of those great moments where I was pulled out of the ‘game’ aspect of things, and totally caught up in the story that our game was representing. The game was set up lengthwise on the table. The necrons who weren’t embarked in their space stations, waiting to be beamed down to the planet’s surface via his flyers, crept across the table towards my line of guardians who were hidden amongst some rock spires. Things became interesting when my vypers came in from reserve mid game, triggering a teleport attack from a Necron lord and his Necron Wraith friends in the back-field of my line! This became a tarpit for some guardians who decided to lock them up in combat before they could do the same to them. The Farseer and the Necron lord tried to kill one another in challenges. I had hopes as I had gotten the lord down to 1 wound with a singing spear, but he caught up to me and doubled out the farseer’s t0ughness killing him outright. I made a dumb mistake which took the game from a draw to a loss. I had it in my head to keep one of the guardian squads back to mind an objective, but with a lapse of judgement advanced them to put pressure on some recently arrived Necron reserves. This gave Ryan the opening he needed, dropping off small scoring Necron warrior squads onto the objectives on my side of the board. It ended up being a 1 point loss to me but again, a fantastic and very fun game. Ryan’s army was gorgeous and he has a ton of talent, especially with an airbrush. I drew a lot of inspiration from his work. 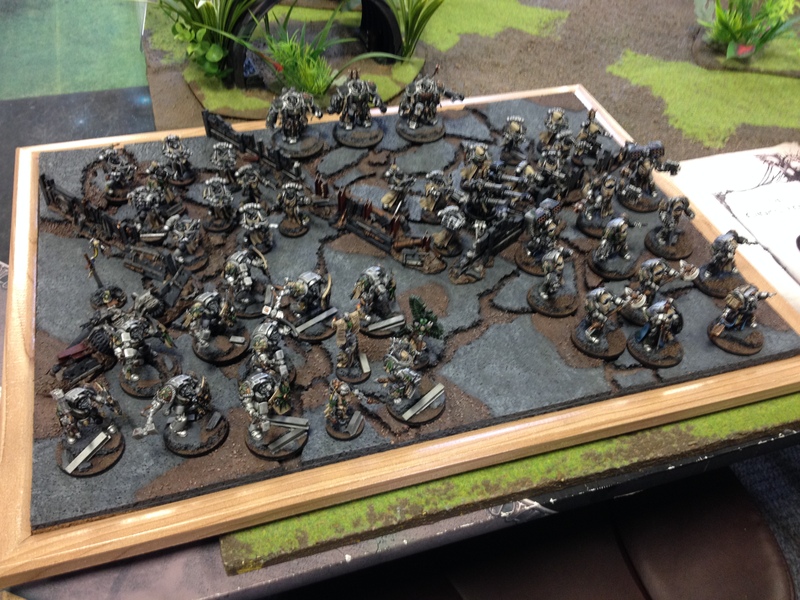 Chris had a lot of very sweet scratch built elements to his army. This defense line is a great example of what he brought to the table. 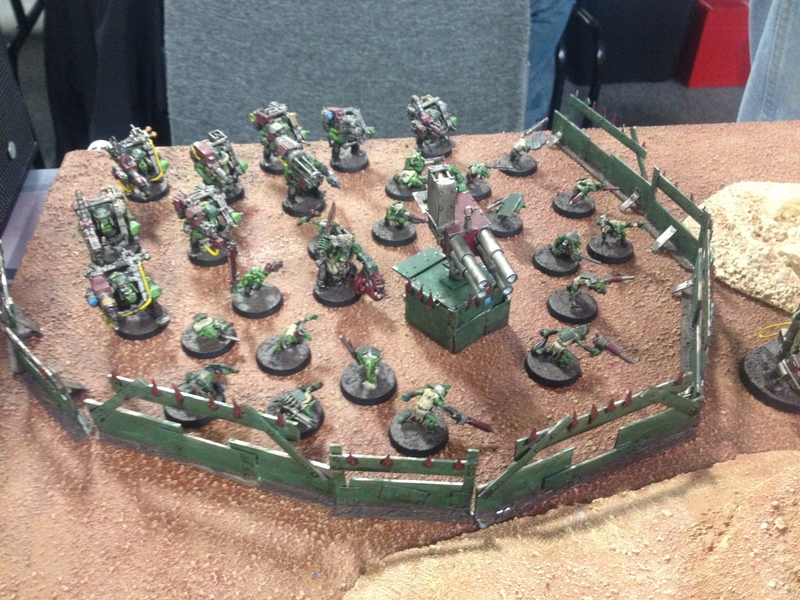 Chris had an Ork army with a ton of character. In deployment he dropped down 5 scratchbuilt battlewagons which were part of what gave his army so much character. These came storming across the table at my line. As the mounted orks stormed forward in their claptrap vehicles the Eldar fell back in good order but displaying abysmal accuracy with their bright lance platforms, even with psychic support from the Farseer. I kept most of my army in reserve, this and the desperate defense of the Eldar in the face of advancing massed armor made this game feel very Flames of War. 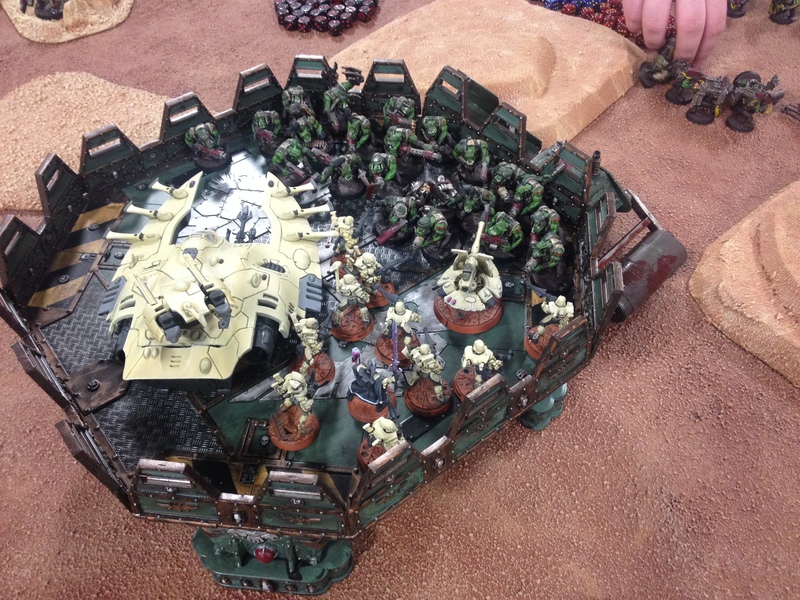 Once my reserves came in I was able to bring some hurt to the advancing Orks. 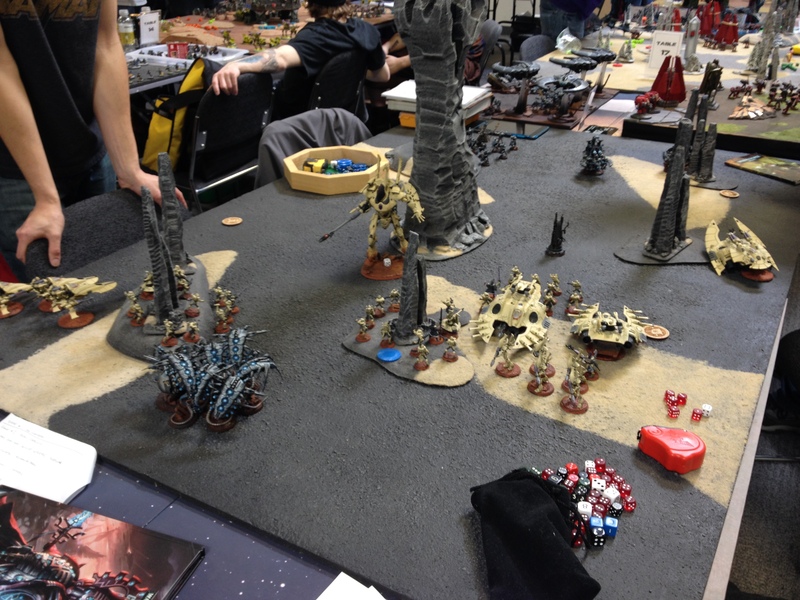 A serpent strike of Wraithguard ended a mega-armored nob unit only to have them reappear at the opponents edge of the table! The scenario had a ‘endless swarm’ like rule for infantry and monstrous creatures. Later in the game the theme of the Wraithknight tying up expensive HQ units in combat and giving me Slay the Warlord points (WK gave me StW in my first 3 games!) continued as he dispatched the Ork Warboss. I felt confident I had this game until disaster struck! In case you were wondering, this is what disaster looks like. There was a 3 point objective on a landing pad in the middle of the board. After knocking one ork unit off this piece of terrain, my guardians in a wave serpent landed on the objective, popped off ‘conceal’ and hunkered down to wait out the end of the game. Unfortunately a battlewagon sitting next to the landing pad which I thought had a token group of meks in it barfed out a full Ork mob onto the objective, pushing the guardians off of it and destroying their sweet grav-tank whip! By this point I had accumulated max bonus points from killing recycled units coming in from reserve which made the game a draw! Joe’s list was the hardest most competitively oriented of all of them that I faced over the weekend. He knew how to use it as well. Joe described his recent history with 40k as being somewhat flier-centric. 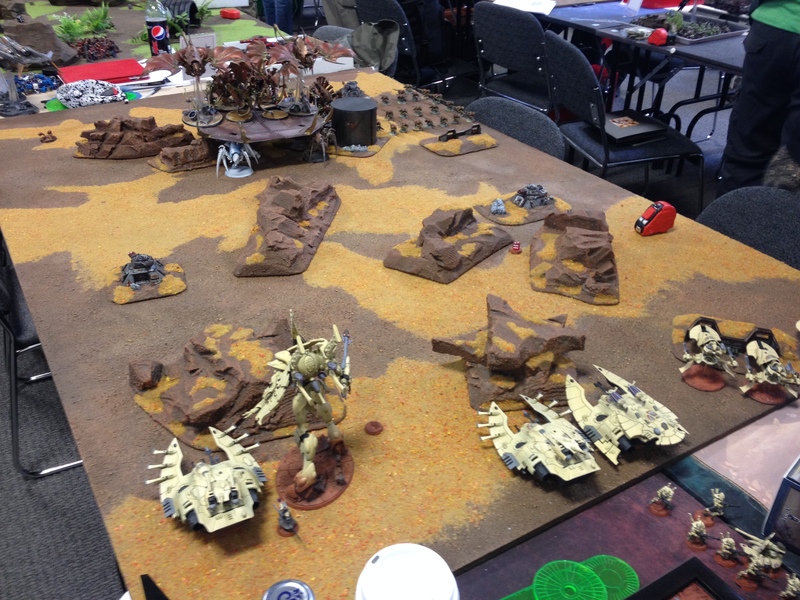 His mass of tyranid horrors crept across the length of the table towards me while 2 Hive Crones and 2 flying Hive Tyrants swept out of the sky upon my poor space elves! 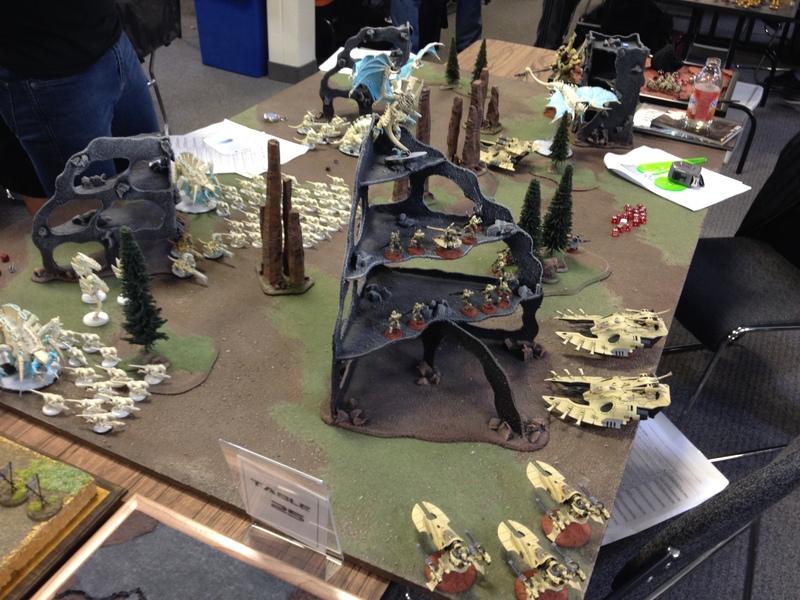 This game’s scenario had a large amount of tournament points tied around killing a specific model, chosen by each opposing player after deployment. Joe and I both knew what to choose, and how to do the deed. I chose one of his Crones (tons of shurikens vs MCs looked good in my theory hammer sessions) while he chose my Wraithknight which made me suspicious. As the nid flyers screamed towards me I formulated a battle plan: spray each MC in turn with volume of fire, and then let more potent units finish the job, in this case the Wraithknight and the Wraithguard. 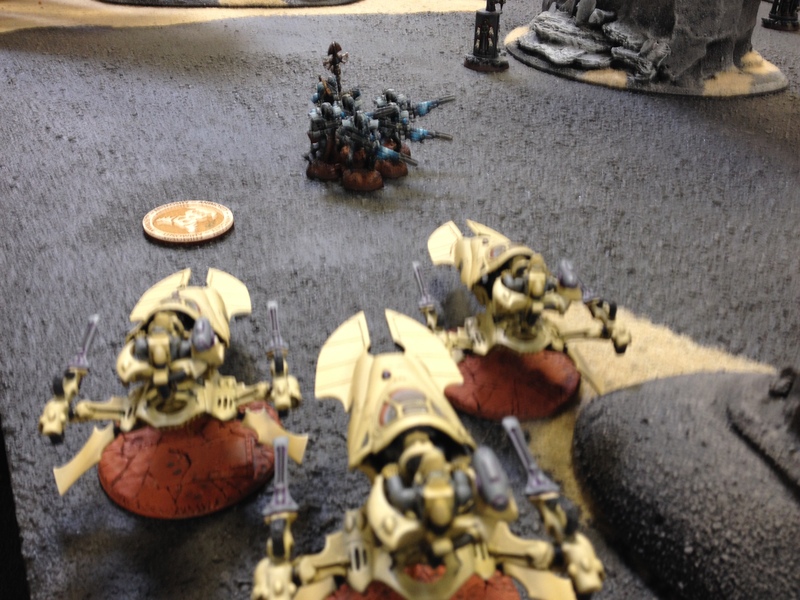 Joe obliged by parking both of his flyrants in front of the serpent with the wraithguard in it! I had a chance here. I could bag both of them with my distort template weapons if I could only ground one or both. I unleashed every possible shot available (with the exception of the vypers who were busy failing to ground the target Crone) at the flying beasts, scored a respectable amount of hits, did several wounds across the two tyrants, and then Joe passed each and every grounding check. Crap. What happened next was obvious. The nids landed and proceeded to eat each of my units in turn. 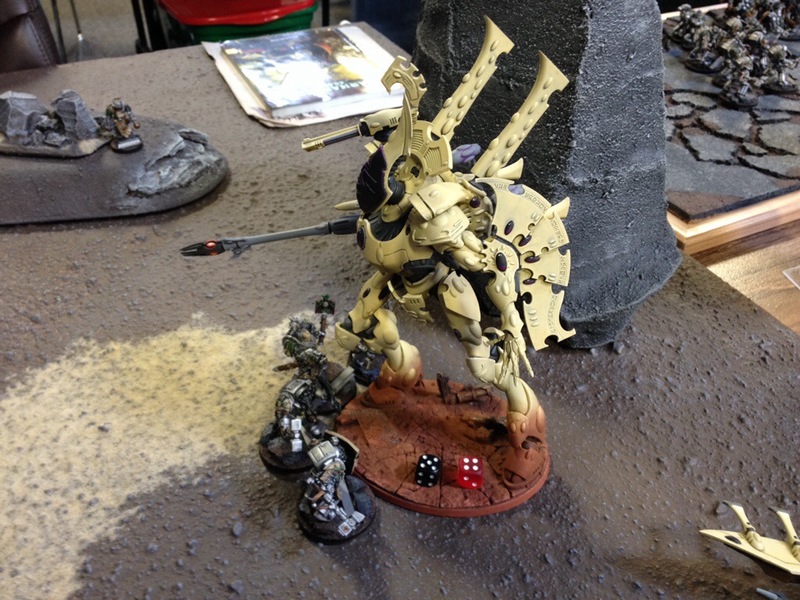 One of the tyrants had some freaky close combat weapon with the ‘instant death’ rule which chopped the Wraithknight down, the only time I lost him all weekend. I was able to kill the target crone which made getting tabled by Joe a little more palatable. We had a fantastic, very challenging game, and the two of us hung out to chat over lunch, talking hobby, tactics, and randomness. He was a very good player and I’d like to take him on again. Game 6 – More nids! More Ryans! 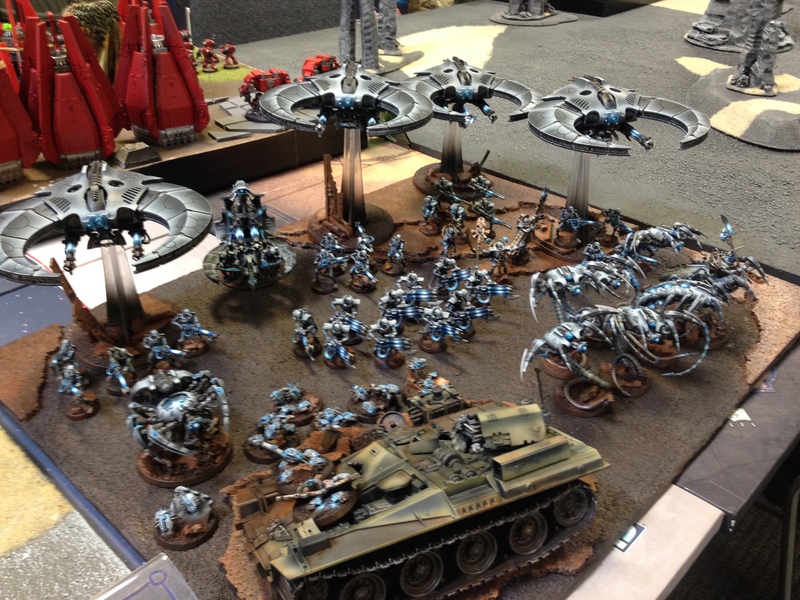 Ryan Blackcloud’s Tyranid horde! This time the entire nid horde came at me en masse! Two Tervigons spawned large units of gants while a crone and a flyrant flew over to hassle my line. The flyers first as a distraction worked again as Ryan managed to nail every grounding check he made. The tyrant which was perched on top of a tall ruined building in my deployment zone was one of my primary targets as the most VPs was to come from eliminating all the enemy HQs while not losing all of your own. Eventually the flyrant assaulted guardians which were in the building. 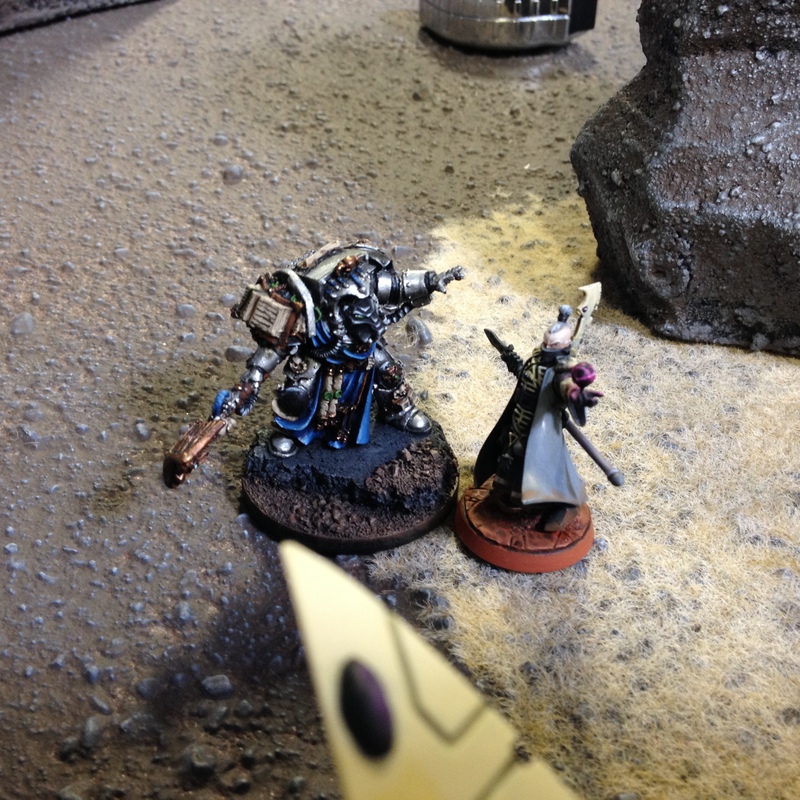 The unit’s Warlock put up a great fight doing several wounds to the beast in addition to one done by a guardian! Naturally the unit was wiped out in time, but revenge would be the Eldars as the flyrant was brought down by some scatterlaser fire. This game was another nail-biter which I felt I had until a tardy Mawlock was able to pop up in my deployment zone gaining ‘linebreaker’ point, and contesting a table quarter which gave Ryan points to offset my HQ assassination by 1!!!! Ryan was a super chill guy, and we had a super fun game. I want to say thanks to Joe, Chris, Tim, and the Ryans for 5 great games that left me with the desire to play more! 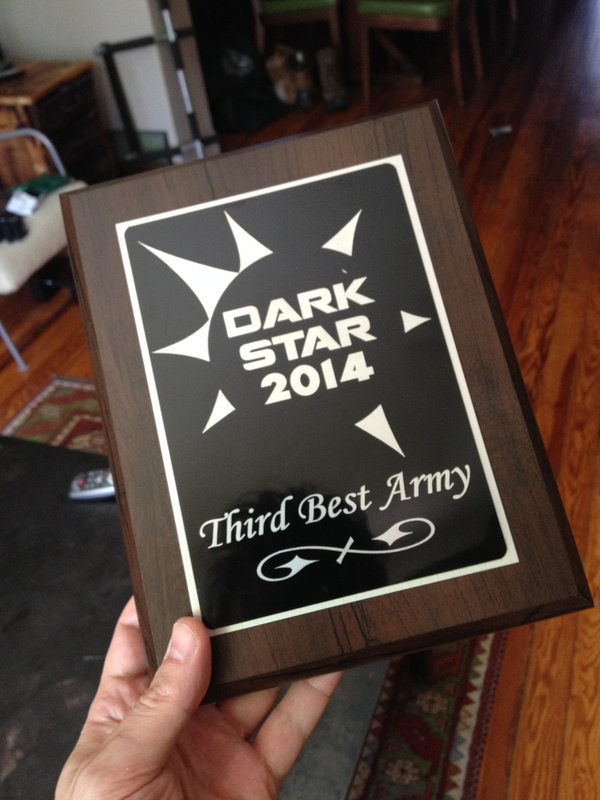 I also want to say thanks to the Dark Star staff who did an amazing job with that event! It was the tightest tournament I have ever experienced but also was relaxed and very inclusive! Random people who came by to chat between games, introduced to me by my various opponents who were locals, were very cool and friendly. My last comment on The Dark Star 2014 is to thanks the painting judges who gave me a ‘bronze’ in army appearance! It was nice to get some props on the army which I have put so much time into. I am excited to refine the paint work some more, finish up some weathering, and to eventually add some new units! Congrats, and well deserved…brilliant use of color with simplicity. I would have voted this best army on style alone!!. I particularly like the vehicles which are subtle but with high end techniques where it counts. Ryan Carlsons Necrons that won BA..are very nice but his airbrushing is more obvious than yours and his army would have looked much better on green board then a reddish brown. in the end its a matter of taste..this is a huge tournament where appearance competition is very high. you knocked it out of the park. 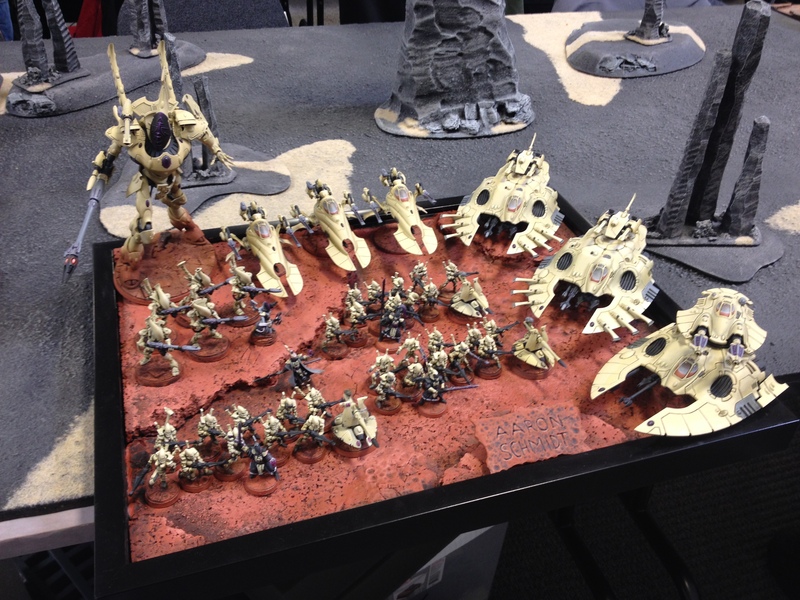 Previous Previous post: Project Eldar – 1 week prior to tournament! Next Next post: Lots of gaming lately!